If you go to the PLOT command in AutoCAD 2009 or 2010 (or AutoCAD 2008 if the DWFx Driver was installed) you’ll have two DWF options; DWF6 ePlot and DWFx ePlot (XPS Compatible). Choosing the DWFx ePlot option will create a .dwfx file that uses the XPS – XML Paper Specification created by Microsoft. 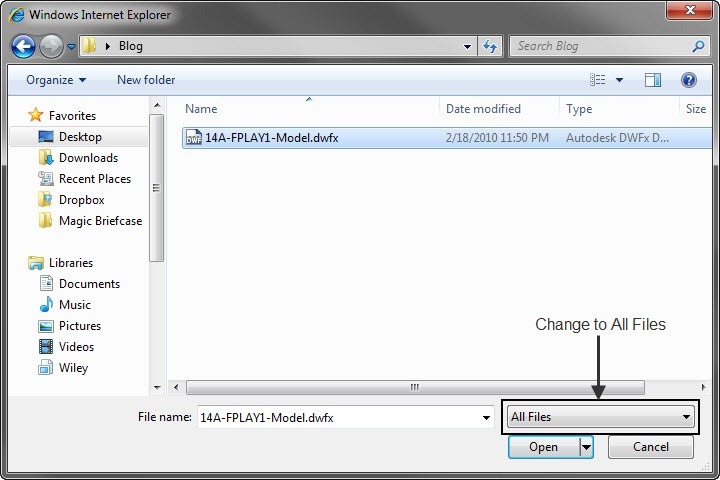 Using the DWFx option over the DWF6 option will make a .dwfx file that anyone with a compatible XPS viewer can open without downloading any additional software; all you need is Internet Explorer 7 or higher (Windows XP users with Internet Explorer 6 can install the XPS Viewer from Microsoft to get this functionality). Launch Internet Explorer, and go to File > Open. 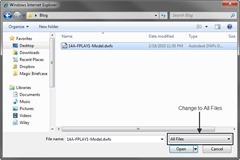 Select the Browse button from the Open dialog that displays. Change the Files of Type drop-down list to All Files. Then browse to your .dwfx file and select Open. You’ll return to the Open dialog where the path to your .dwfx file should display. Press Ok to open the .dwfx. Internet Explorer will begin opening the drawing for you. 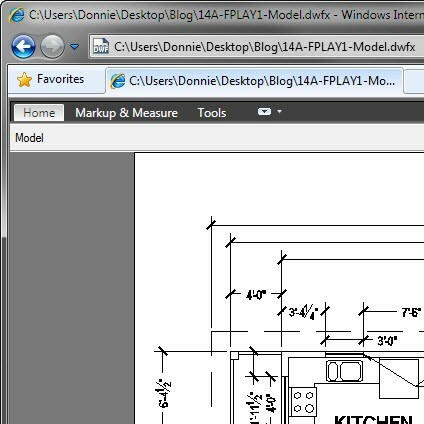 Depending on security settings, you may need to accept an ActiveX control, but the .dwfx drawing will then display inside your Internet Explorer browser. Hi, I unable to plot my worked acad 2010 file, it reader shows some errrs like adobe reader could not open dwf file because not a supported file either or the file has been damaged. so could you please help me dear? none of this helps, other than it will not work so do not bother downloading anything. My IE 7 will not open. Dragging into Word will not open, Cant install the design review same error.. so what is the fix? how do you view these dwfx files? 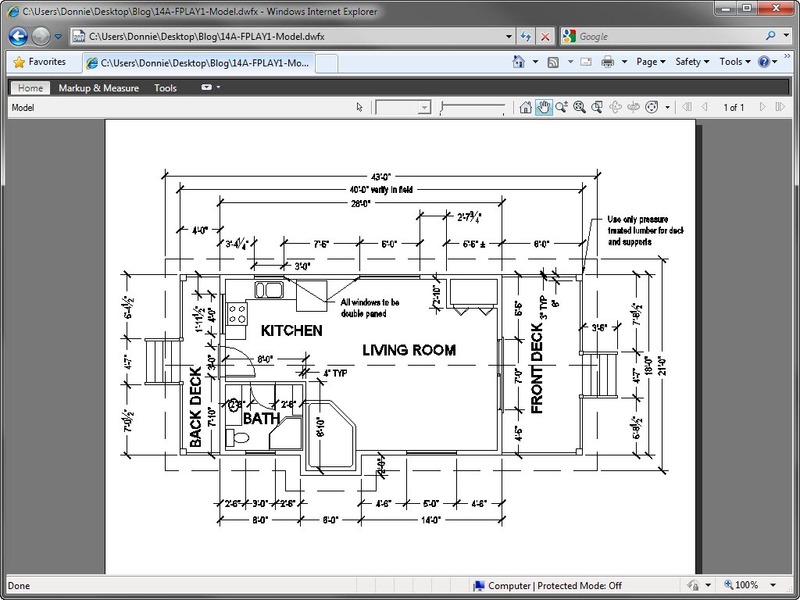 I have AutoCAD 2012 installed, but it does not open dwf files. That’s remarkable because I have the full version of it, which costs more than 5000 euros with VAT, and it is created by the same company responsible for the dwf file format. Autodesk Design Review 2013 failed to inform me that it is incapable of downloading the x86 version of Visual Studio 2010 SP1 C++ Runtime. I had the x64 version of this runtime. Thanks for sharing such nice information as it is very helpful rather than downloading the softwares. thanks..
Great tip…you can also drag and drop dwf(x) files in Microsoft Word. How is "may need to accept an ActiveX control" compatible with the article title "without downloading anything" ? The concept of downloading anything means to have your clients, developers, sub-consultants download viewers. Download and/or installing ActiveX is now a daily procedure as one uses the web browsers. 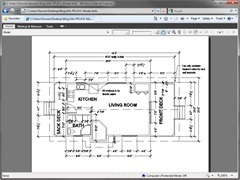 I am one of the leaders in the industry that up to this point think that while DWF is a fantastic idea it will never measure up to PDF due to "downloading" and learning a new application. This article is an eye opener for me, I will be asking my technical CAD Managers to take a hard look at this as a solution. >Download and/or installing ActiveX is now a daily procedure as one uses the web browsers. Bullshits. Installing browser plugins increases the exposure of the system to security risks from Internet. Aside from that the browser plugins may have privacy and/or stability implications. The Microsoft update site itself uses activex controls to display and improve usability. They are very common now with the build of websites. There are some areas of life where if you stand still you are travelling backwards.